Here we first look at what a CPLD is and then look at one of the languages (VHDL) that can be used to create the logic circuit used to configure a CPLD. Complex Programmable Logic Devices (CPLDs) are ICs that can be used to replace circuits built from several logic ICs (e.g. the 74 series of logic devices – 7400, etc.). Unlike a discrete logic IC circuit, the logic in the CPLD can be changed again and again with no need to modify the PCB when changes are made. One of several Hardware Description Languages (HDL) can be used to create the logic circuit on a PC. A program is used to convert this logic design into a format that can be loaded to the CPLD. The tools used to program a CPLD are very similar to those used to program an In-System Programmable (ISP) microcontroller. The logic circuit is written in a text editor or IDE using a hardware description language. The text file program is then converted to a format that can be loaded into the CPLD. A JTAG programmer is used to load the logic circuit into the CPLD (configure the CPLD) while it is soldered in the circuit. Non-volatile memory – the logic design that is loaded to the CPLD will not be lost if power to the CPLD is switched off. The logic circuit in the CPLD will be ready when power to the CPLD is switched on. Internally a CPLD consists of programmable AND / OR array as well as macrocells. CPLDs are available in different sizes – both physical (number of pins / IC package size) and logical (number of gates and macrocells). VHDL is a hardware description language (HDL) that can be used to describe a logic design. Software tools can then be used to read the VHDL logic design and produce a configuration file that can be loaded to a CPLD or FPGA which will then implement the logic design on the CPLD or FPGA. VHDL stands for VHSIC Hardware Description Language. This is known as an embedded acronym (an acronym (VHSIC) inside another acronym (VHDL)). VHSIC stands for Very High Speed Integrated Circuit. VHDL is standardised by the Institute of Electrical and Electronics Engineers (IEEE) and is a vendor independent language. This makes it portable and reusable. Most statements in VHDL occur concurrently (in parallel with each other), rather than sequentially as normal computer programs do. 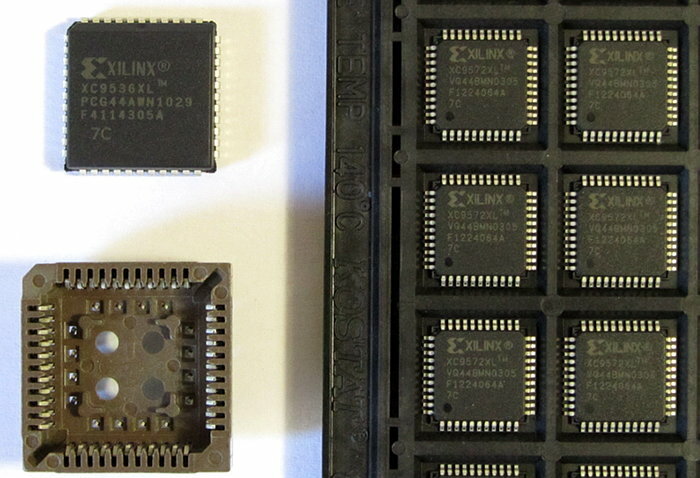 One of the alternatives to VHDL is Verilog (also a standardised and vendor independent HDL). As this is a practical course, you will learn more about VHDL as you follow the tutorials. You can read more about VHDL on the Wikipedia VHDL page, also read about VHSIC on Wikipedia. There are also many books available on VHDL.